NIACL Recruitment 2019: The New India Assurance Company Limited or better known as NIACL has released the official notification. The notification declared recruitment for 312 Administrative Officers (Generalist & Specialist) Scale I. Working with NIACL is a matter of prestige and honour for any common man. With a great job that the title offers, also comes goodwill. Applicants who are on the lookout for working with a brand like NIACL should register themselves for the exam. A candidate must possess the minimum qualification of a graduate/post graduate in any discipline from a recognised University or any equivalent qualification recognised as such by the Central Government with at least 60% marks in either of the degree examinations for General candidates and at least 55% marks for SC/ST/PwBD candidates. Applicants must be a minimum of 21 years old and a maximum of 30 years old. However, there is age relaxation for reserved categories as per government norms. The NIACL application form will be made available on 10th December 2018. Application for the exam will only be accepted online and you cannot apply from any other means. The online application form will be made available on the NIACL official website – newindia.co.in. Step 2: Click on the link for recruitment. 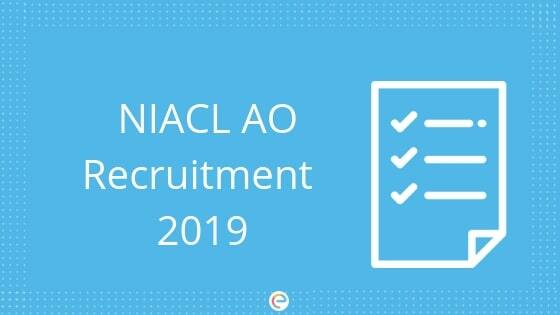 Step 3: Click on the link for online registration for NIACL AO Recruitment 2019. Step 4: Enter the necessary academic and contact details. Step 5: Upload scanned image of your photograph and signature in the format and dimension mentioned. Step 6: Make payment of NIACL application fee. Step 7: Review everything that you have entered and submit. Step 8: Take a printout of the online application form for future reference. NIACL AO prelims have 3 sections. Except for English language section, Reasoning Ability and Quantitative Aptitude section will be available in both English and Hindi language. The time duration for all the three sections is 20 minutes each. Main Examination consists of Objective Tests for 200 marks and Descriptive Test for 30 marks. Both the Objective and Descriptive Tests will be online. Candidates are required to answer Descriptive Test by typing on the computer. Immediately after completion of the Objective Test, Descriptive Test will be administered. The Descriptive Test of 30 minutes duration with 30 marks comprises a test of English Language (Letter Writing-10marks & Essay-20 marks). The descriptive test will be in English and will be conducted through online mode. Descriptive answer script would be evaluated only in respect of those candidates who qualify the objective test. Applicants who get shortlisted at the end of Phase-II (Mains) will subsequently be called for an Interview to be conducted by NIACL. The interview will be conducted at the selected centres. The weightage (ratio) of online Examination and Interview will be 80:20 respectively. The centre, address of the venue, time & date of Interview will be informed to the shortlisted candidates in the call letter. Applicants are required to download their interview call letters from NIACL official website. The NIACL admit card or hall ticket will be released on the official website of NIACL. Applicants will have to login to their account in order to download their admit card. The admit card will not be sent to the applicants through post or in person. Applicants are required to download the admit card from the official website. It is mandatory for the applicants to carry their admit card in the exam hall, without which they will not be allowed to sit for the exam. Now that you have all the relevant information regarding NIACL Recruitment, we hope you do not face any issue with the registration process or any of that kind. Now that the exams date are out, you should buck up and start with your preparation. The exam is a competitive one and you need to be better than the rest to be able to join the league. Practice as much as you can. You can opt for practising Bank Mock Test Paper on Embibe. As most of the bank exams have the same sections and pattern, you will have the idea about the upcoming questions. Also, you can test your time management skills through practising bank mock test papers. If you face any issue regarding NIACL Recruitment, do let us know your query in the comments section below and we will get back to you in no time.